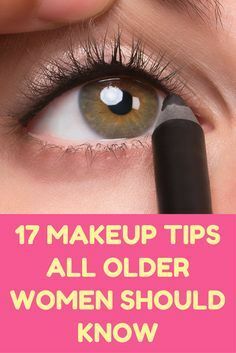 17 Makeup Tips All Older Women Should Know. Bored with your usual look? Seen a technique or product that you’re clueless about? Missing that glow you had in your younger days? Well, all things are possible with the internet. Thousands of makeup artists, beauty gurus, and downright clever people have an unlimited amount of beauty wisdom to share – and a place to share it. Get started now with 17 of our makeup and beauty tips, trick, and hacks. For many of us, powder was the first “adult” makeup item we got our hands on. That makes sense when you consider that during our teen years, our skin was a lot oilier. In our 20’s, we still stick to powder to set liquid and prevent shine during long nights out on the town. But in regular, everyday settings, powder does us few favors. In fact, it can be incredibly aging. Powder, no matter how well-applied, eventually settles into creases and tiny wrinkles you didn’t even notice, accentuating things we definitely don’t want to draw attention to. Instead, use a setting spray. There are a range of formulas that can do exactly what you aim for, like preventing shine or keeping foundation in place. You can also replace powder blushes and bronzers with cream formulas that won’t highlight wrinkles. Do you remember the first time you tried to apply falsies? Perhaps you quickly thought that it wasn’t for you. But anyone can wear them, as long as they pick the right kind (think wispy and not overlong). Also, applying the perfect amount of glue is essential. Globs of eyelash glue can make your eyes look wonky, or worse – you end up temporarily sealing your eyes shut. Too much glue will ruin the rest of your eye makeup and contrary to what you’d assume, make the lash unstable and prone to falling off. To do it right, use the round-capped ends of a bobby pin. When the tip is covered, run it gently along the edge of the lash. Use a pair of tweezers to carefully place the false lash along your actual lash line and let it dry. Are you unsatisfied with the lip color selection that you have to choose from? Well, try making your own! Just mix some loose pigment (such as eye shadow or blush) with some salve or petroleum jelly, and you’ve got your own homemade lip color! Try it with subtle pinks, or wacky blues. It’s so much fun! Tinted moisturizers give your face a slight tint of color, brightening and evening your skin tone, while also adding moisture. It makes your face look sheer and dewy, as opposed to a “caked up” look that most foundations produce. Simply add a dab of foundation to your moisturizer, and apply. You’ll love the way you look. If you need to touch up your blush throughout the day and don’t have your compact handy, you can actually use your lipstick. A pink or red lipstick in a satin formula blends out nicely and creates a natural flush. This is also a great trick to use while traveling. Next Article Boil These 2 Ingredients and Get Rid of the Stubborn Belly Fat…!!! MARILYN MONROE’S BEAUTY SECRET’S: Get The Look !